The keystone of CSIRO’s R&D relationship with the Australian woolgrower has been the push for new and improved products. The vision of a group of scientists and engineers and the capability of CSIRO took a major innovative step with the creation of OPTIMâ„¢ ‘ a whole new textile fibre based on wool. OPTIMâ„¢ processing technology re-engineers wool fibres by stretching to make them softer, stronger and lighter than the untreated wool. Two new kinds of fibres have been created ‘ OPTIMâ„¢ Fine and OPTIMâ„¢ Max. The OPTIMâ„¢ Fine manufacturing process stretches 19 micron wool fibres between 40 and 50 per cent, making, on average fibres 3 to 3.5 micrometers finer. The reduced micron fibre is then chemically set in this finer, softer form. OPTIMâ„¢ Fine has increased length and strength, as well as a silk-like lustre, but retains many of the desirable properties of fine wools. Synchrotron analysis by X-ray diffraction confirmed that the structure of the OPTIMâ„¢ Fine fibre was silk-like (mostly Î²-sheet structure) after treatment. In the production of OPTIMâ„¢ Max fibres, wool sliver is stretched to give an average fibre extension of 20-30 per cent, which is temporarily set. The stretched fibres are then blended with normal wool and spun into yarn. During the finishing of the yarn, it is immersed in hot water causing the OPTIMâ„¢ Max fibres to retract to their original length. This causes the normal wool fibres to buckle and distort giving a soft, lightweight bulky yarn for the manufacture of lightweight garments, particularly knitwear. The technology, invented by David Phillips at CSIRO Textile and Fibre Technology, was developed during the 1990s with joint funding from the Australian woolgrower through the Australian Wool Research and Promotion organisation. It relied on a thorough understanding of the structure of wool fibres and the interplay between the chemistry and physics of the fibre. The process was licensed to Woolmark who commercialised the sale of OPTIMâ„¢ machines globally. Since the amalgamation of Australian Wool Innovation Ltd (AWI) and Woolmark in 2007, AWI has taken over the further development and commercialisation of OPTIMâ„¢. The resulting fibre is now marketed as Arcana. Stretching fibres has always been a technique that gives insight into structure and properties. In the early 1930s, English physicist and molecular biologist William Thomas Astbury showed that there were drastic changes in the diffraction of moist wool or hair fibers as they are stretched significantly (100%). The data suggested that the unstretched fibers had a coiled molecular structure with a characteristic repeat of 5.1 Å ( = 0.51 nm). Astbury proposed that the unstretched protein molecules formed a helix (which he called the Î±-form) and that stretching caused the helix to uncoil, forming an extended state (which he called the Î²-form). Although incorrect in their details, Astbury’s models were correct in essence and correspond to modern elements of protein secondary structure, the Î±-helix and the Î²-strand (Astbury’s nomenclature was kept), which were developed in 1951 by Linus Pauling and Robert Carey. The force required to stretch a wool fibre is a sensitive indicator of chemical changes and single fibre experiments were the basis of much of our current understanding of wool (and hair) science. In the 1990s, this body of fundamental science (including key work at CSIRO) was to lead to a dramatic piece of applied research. 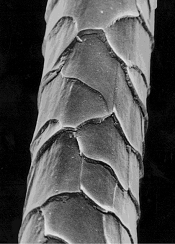 After much experimentation by researchers such as David Phillips and Jack Delmenico it was shown that the best way to do this was to take wool that had been scoured and combed (a form referred to as sliver), twist it to keep the individual fibres from slipping and then stretch the sliver in steam. The final product was noticeably whiter and softer when spun into yarn and the approach looked very promising. At this stage this work was conducted as an aside to the Division’s contracted research. It was referred to as a ‘ten percenter’ after the amount of time one Chief of Division had conceded should be devoted to such activities) and was not discussed widely. The machine had a number of sections; in the first zone multiple slivers were twisted together and in the following zones these slivers were stretched by up to 60% and allowed to relax and become fixed in the stretched state. All these stages had to be carried out in steam and the machine built had an overall length of about 40 metres; not bad for an unofficial project! The machine worked with surprisingly few teething problems and the fibre produced had excellent whiteness and softness as expected as well as a ‘silk-like lustre’. The time had come to present the process as a ‘project proposal’ to the Australian Wool Corporation. The major funding body were somewhat amazed by the amount of work that had already been done, and were enthusiastic and suggested their network of development centres could evaluate the fibre. A large consignment of stretched fibre was sent to IWS main technical centre in Ilkley, UK to be processed. Apart from the technical side of the product, there were strategic issues that required delicate handling. The key issue was the question of the aim of the process; was it to turn coarse grades of wool into a rival fibre for superfine merino, or was it to turn the finer wools into a high end luxury fibre. Whichever strategy was pursued there could be a perception amongst woolgrowers that the marketing structure was being undermined, particularly that some woolgrowers would get a shortcut into the superfine category of wool which normally takes expensive and lengthy breeding programs. The researchers waited anxiously for word on their fibre from Ilkley and when the feedback came it created a crisis; the technical staff with their extensive experience in the European wool industry had found great problems processing the consignment. The biggest problem was that most of the fibre had been spoiled in attempts to dye it. It turned out that the methods used to dye the fibre in Geelong were effective, but when commercial techniques were used some unusual properties of the fibre caused difficulties. Two members of CSIROs colouration research team were drafted into the project to try and solve these problems urgently. David King and John Rippon identified the poor physical properties when wet as the key issue. Dyeing of textile fibres relies on a uniform pattern of flow of dye solution through an evenly packed and stable array of fibres. When OPTIMâ„¢ fibre is wet out in the dyeing process it becomes very plastic and is deformed by normal flow pressures encountered in industry resulting in uneven dyeing. King and Rippon developed modified dyeing methods in which the fibre was stabilised and commercially acceptable dyeings resulted. After the initial difficulties were overcome, product development was undertaken with commercial partners in Japan and Italy. OPTIMâ„¢ was trialled in a huge range of products ranging from woollen jumpers to luxury scarves competing with cashmere. A pin stripe suit fabric was woven in Geelong and former CSIRO CEO Malcolm Macintosh wore a suit made of this fabric when he was knighted at Buckingham Palace in 1996. Work by Gary O’Loughlin and Linda Mazurkewicz showed that if OPTIMâ„¢ was produced without permanent set it could be used to produce high bulk knitwear that was lighter than conventional woollen garments. Momentum and interest built and a commercial machine was planned. As with all developments there were inevitably IP issues; it was found that a US patent used very similar mechanisms to treat cotton and the next model machine had to be designed so as not to infringe that patent. The overall length of the machine was virtually halved by an innovative mechanism designed by CSIRO’s Keith Thomas which combined two of the zones. The process was licensed to Woolmark who commercialised the sale of OPTIMâ„¢ machines globally. By 2009 there were 6-8 commercial machines operating world-wide with much of the fibre being used in blends with other fibres. Since the amalgamation of Australian Wool Innovation Ltd (AWI) and Woolmark in 2007, AWI has taken over the further development and commercialisation of OPTIMâ„¢. King D, Rippon J, 2009, Personal communication.